Leeds United’s unbeaten record under Marcelo Bielsa was ended by a smash and grab raid from Garry Monk’s Birmingham City side. Monk had the last laugh on his former employees by coming back to Elland Road to take the points as his side opened up an early two-goal advantage then defended the lead with a strong back line and dubious time wasting tactics backed up by referee Peter Bankes’ dreadful handling of the match. Ezgjan Alioski did pull a late goal back for Leeds, but they were unable to add to it in eight minutes of stoppage time and went down 2-1. There was little sign of the brilliant, flowing football of Tuesday night as the Whites looked a little leg weary and came up against determined opponents. They were given a shock in the eighth minute as Che Adams’ shot from the edge of the box deceived keeper Bailey Peacock-Farrell, who went the wrong way and could not keep the ball out of the net. There was no instant response as United could not get their passing game going and the visitors doubled their lead in the 29th minute with their second shot. Adams again found the net with a strike from the edge of the box that went in off the post. Again Peacock-Farrell looked like he could have done better and Leeds were left with a mountain to climb. That was it as far as efforts on goal were concerned from Birmingham apart from a Jacques Maghoma volley that was blocked as they backed off and settled for frustrating the hosts. United boss Marcelo Bielsa responded by changing tactics and taking Kalvin Phillips off, putting Stuart Dallas on. It seemed a strange move so early, but the team instantly improved with Dallas getting a cross in that was headed on by Tyler Roberts only to be well cleared at the far post. Jack Harrison blasted a volley over and Alioski fired over Leeds’ best chance of the half after the ball fell nicely for him in the area. Liam Cooper then headed wide from a corner and although he threw himself at the ball Roberts could not quite touch it into the net. The good work continued into the start of the second half with Roberts seeing a shot deflected wide. But the game then got broken up with numerous players going down injured, blatant time wasting tactics and some massively inconsistent refereeing decisions. There was no flow to the game, but United - roared on by the backing of a near 35,000 crowd, geared up for a big finish. Substitute Adam Forshaw saw his low shot from the edge of the box saved and keeper Lee Camp followed up with a comfortable save from Dallas’s weak shot. Another Dallas effort from the edge of the box was deflected just wide before Leeds finally found the back of the net four minutes from the end of normal time. Alioski got on the end of a Saiz crossfield ball and sent his angled volley past Camp to make it 2-1. With eight minutes of added time to be played United went for more as Alioski’s volley was easily saved. They then had one final effort when Dallas turned well on the edge of the box only to see his low shot well saved by Camp. 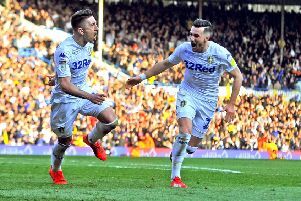 Although the Whites huffed and puffed for the remainder City held out to become the first visiting team to take a league win home from Elland Road this season. Even though Birmingham’s tactics left a sour taste the fact was that Leeds had not done enough this time. They could have grabbed a point at the end, but valuable lessons will have to be learned. They still remain top with Brentford and Middlesbrough also failing to win. United head coach Bielsa blamed himself for the poor start his team made. He said: “The team I chose at the beginning was not the right one. Phillips played in front of Jansson and Cooper and we couldn’t link defence into attack. “The first 30 minutes we were not fluid to move the ball and we didn’t recover the ball well. “Kalvin Phillips had to assume the consequences of the mistake I made. “After that we dominated the opponent and created chances to score. We dominated 70 or 80 per cent of the time and we had twice the number of chances to score than the opponent. “The game was very tough. It was not easy for us to move the ball and we made many technical mistakes and we were not fresh enough to develop our game because the spaces were small. The small spaces exhausted our offensive players. On the time-wasting tactics employed by Birmingham that led to one of Leeds’ coaches getting a yellow card, he added: “The referee applied the rules as he could. The irritation was that the same event occurred several times. “For example if a player goes to the ground the referee has to stop the game. The problem is that this happened many times because the opponent had many injuries and this provoked irritation. Birmingham boss Garry Monk said he had no hard feelings about the reception he got from the home fans who jeered him at the start. “It’s good to see Leeds playing well, top of the league and the best team so far. I hope they get into the Premier League because they are a great club. They should be in the Premier League and if they go into that they will be a big club in there. Leeds: Peacock-Farrell, Ayling, Jansson, Cooper, Douglas (Edmondson 71), Phillips (Dallas 34), Harrison, Klich (Forshaw 62), Saiz, Alioski, Roberts. Birmingham: Camp, Colin, Morrison, Dean, Pederson, Ramallo (Harding 88), Gardner (Kieftenbeld 59), Lakin, Maghoma, Jutkiewicz (Boyle 81), Adams.